A wolf whose pack was determined to have killed a calf on the Flat Top Ranch near Carey this summer was shot Sunday by a hunter in the Little Wood River drainage. The black female, known as B4-12 was the alpha of the Bell Mountain Pack near Carey. Jerome Hansen, Idaho Department of Fish and Game regional supervisor, said the female was the 15th wolf killed so far in the Southern Mountains Zone, which encompasses the Big and Little Wood drainages. "I don't know the exact location," he said, but added that the wolf was killed somewhere near Baugh Creek by a hunter, rather than as a control action by the Idaho Department of Wildlife Services. Hansen said the area is a mosaic of private and Forest Service-managed and BLM-managed federal land. The nearby Flat Top Ranch provides access to the area, but owner John Peavey said he hadn't heard about the incident. Hansen said the hunter had a tag and reported the animal to officials. He said the wolf was an 83-pound full-grown adult with a radio collar. Ordinarily, one of 15 wolves killed this season would be business as usual to wolf advocates. But local activist Lynne Stone said this wolf had a compelling story. "I was so hoping she could stay hidden and stay high," Stone said, adding that she prayed this wolf would survive the season. According to Stone and local wolf observer Natalie Ertz, this female wolf had survived three separate kill orders in different locations before being shot by the hunter this weekend. The first kill order was issued by the Department of Fish and Game on the Soldier Mountain Pack near Fairfield, where the wolf was first tracked and collared. The wolf was identifiable through missing toes on one foot, where she had been caught in a coyote trap in 2008 and attempted to chew her way out, Stone said. Ertz said in September that the wolf had actually been caught in coyote traps on three occasions and suffered an injury to another front leg, which caused her to limp. "She's had a really tough life," Ertz said. "This is a wolf that has clearly survived a lot." Stone said the wolf left her pack in the Soldier Mountains in 2009 after two of her six pups and a fellow adult pack member were killed. In the fall of 2009, the wolf disappeared from state radar despite her radio collar, not to appear again until January 2011. "A lot of people thought she was dead," Stone said. "[Then] on New Year's Day 2011, I saw her walking up a big mountain." The wolf remained without incident until August, when John Peavey said the Bell Mountain pack attacked and killed a calf on his Flat Top Ranch. 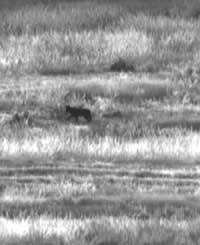 Though four additional sheep deaths were determined to be by coyotes, Idaho Wildlife Services determined the calf was killed by a wolf in the area. "This was pretty obvious, especially as the collared wolf was standing right there," said Todd Grimm, district manager for the federal Wildlife Services agency, in September. B4-12 survived that kill order, which took a total of three wolves, including a yearling black wolf that Stone said had come with the wolf from her former pack in Fairfield. Grimm said the order left the collared alpha, one other adult and an estimated three to four pups unharmed. Defenders of Wildlife spokeswoman Suzanne Stone said the alpha female had at least two pups still in a den when she was killed this weekend. "It's a hard time to lose their mother," she said. "They would only be about 6 months of age right now, and wolves don't start hunting on their own until 10 months." Though the proximity of hunters often prompts wolves to leave an area, Lynne Stone said she wasn't convinced this pack would leave. When the control order in August took three of the pack, Stone said she and friends heard the remainder of the pack howling in the same area a few nights later. "They stay and they howl and they grieve and they look for their mother or their sibling," she said. "If a wolf could be crying, they were crying that night."